Koster Keunen, a world class wax supplier with manufacturing sites in Connecticut and Holland is pleased to respond to the current controversy surrounding the use of plastic microbeads in personal care products. Koster Keunen, a world class wax supplier with manufacturing sites in Connecticut and Holland is pleased to respond to the current controversy surrounding the use of plastic microbeads in personal care products. Koster Keunen has been making plant based waxes in bead form for several years derived from sunflower wax and rice bran wax. Both waxes are naturally derived and non-hydrogenated with melt points in the 75-80 C range suitable for wide range of exfoliation applications including cleansers, masks and scrubs. 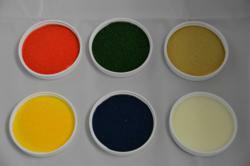 Beads are available in custom sizes and colors allowing for ease of formulation shift from current supply. News items from Plastic Soup and North Sea Foundations has called on the industry to boycott products containing plastic microbeads as a source of danger to marine life as the beads mimic plankton, an important food source. “Our company has pioneered natural waxes since 1852 and the expansion from beeswax to sunflower wax is only the most recent extension of our varied sustainable product offerings” says Koster Keunen President John Koster. Samples and technical data on Koster Keunen’s wax beads are available on KosterKeunen.com, Innovadex.com and BrenntagSpecialties.com or by sending an email to info@kosterkeunen.com.